the wind pulled us on one side as the boat changed its direction, we can only hear the sound of the wind. nothing else. the view was simply breathtaking. 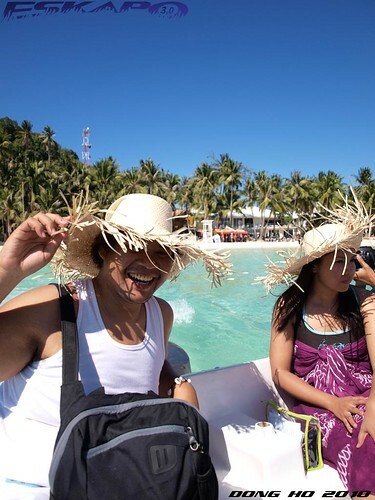 i've experienced seeing great aerial views of the Philippine islands when traveling by plane but the experience of being carried by a parasail while being pulled by a speed boat was different. 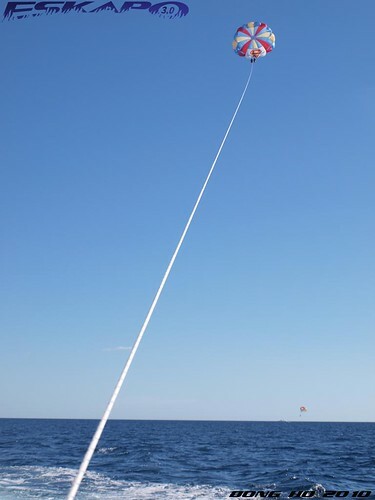 imagine your legs hanging with just a tow rope connecting you to the boat. i remember the time when we were traveling our way to the central beach area. 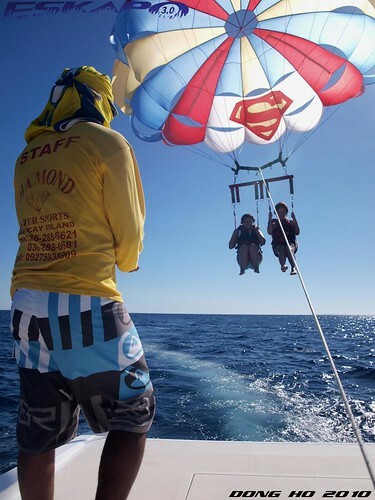 we were given the option to choose between reef walking or parasailing. 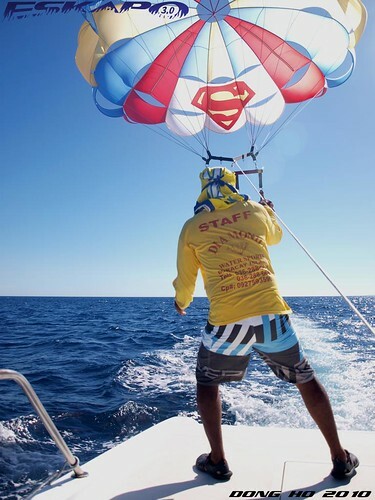 without doubt i along with the majority chose parasailing. though i'm sure reef walking was fun as well. 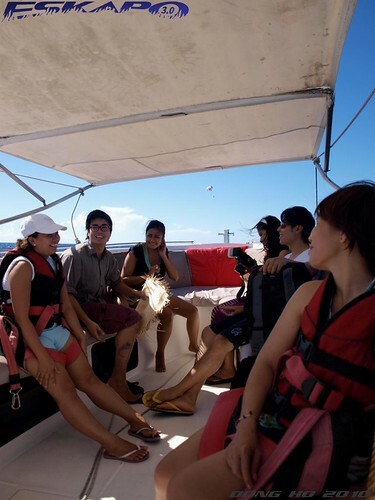 we boarded a small speed boat which just brought us to the lift-off area, which is kilometers away from the shoreline. we were then transferred to a bigger speed boat which holds the parascender. this time we moved even farther from Boracay island's shoreline where the one can already see the other parasailers roaming around the area. i was chosen to do it first along with Travel Life writer April who was as excited. 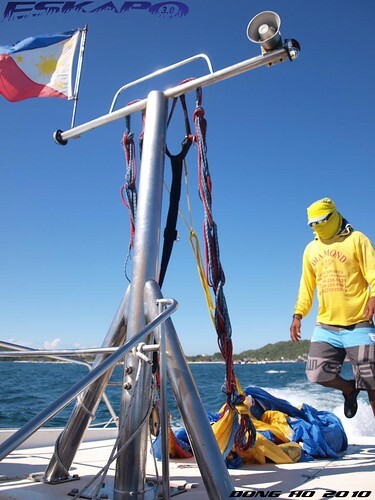 we were given our harness while the staff prepaired the parasail just behind a flat area of the speed boat. the loud upbeat music being played in the boat was perfect before we were lifted off. 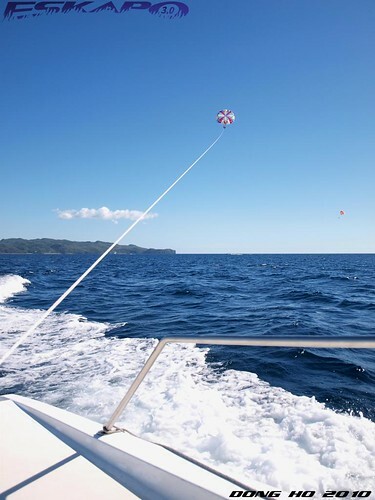 as the staff gave the ready sign, we were gradually being pulled up by the parasail and as we ascend the loud music was fading. it was a good measure of how high we were going, approximately 400-450feet above sea level. the tow rope measures 500feet. the speed boat was so little now from the top that it looked like a toy. a person with acrophobia might choose not to do it, but quite contrary to the perception of parasiling as scary, it isn't. it is in fact considered as a recreational activity. one can feel so relaxed while on top. my companion April even mentioned that she finds the experience a perfect one to ponder on new ideas and stories to write. i definitely agree. after some time, we were already pulled down and can' help but feel so good to have done it. something i'll never forget. something i know that i'll do again and again and again. 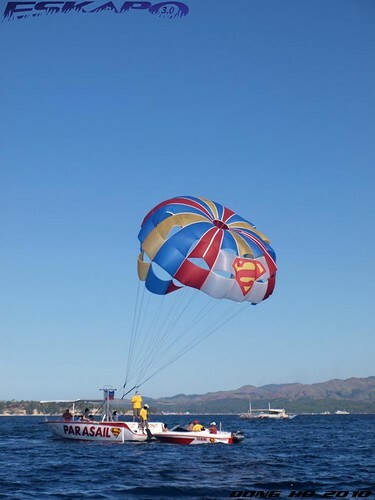 to parasail in Boracay, look for the parasailing booth at station 2 area, where one registers and is assigned per batch to a speedboat. 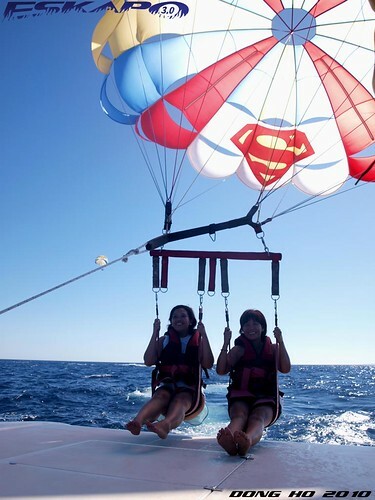 parasailing costs between P2000-P2,500 as of this posting. 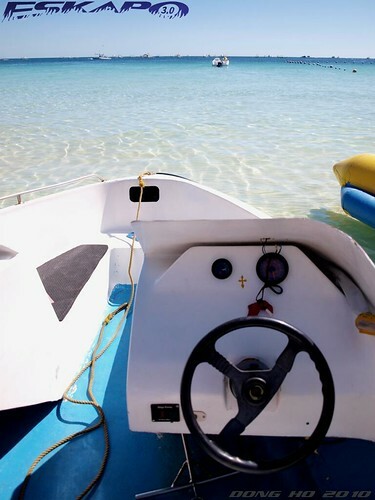 when you're in Alta Vista de Boracay, the resort staff can arrange a schedule for parasailing and other beach activities around the island. wow, ibang level na to.. sana maka-experience din.. wow, wow talaga!!! Wow, what an amazing experience. I have fear of heights but I want to try this one. saya naman! 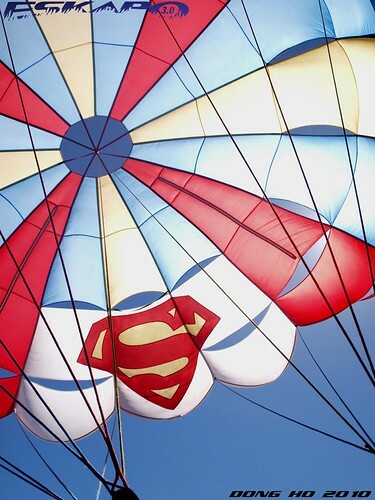 i want to try it when we get back to the island ....but the cost makes me think otherwise. wow! ang saya naman. kaya lang hindi yata kaya ng powers ko yan. Oh, wow. That looks like a delightful time for some wonderful friends. 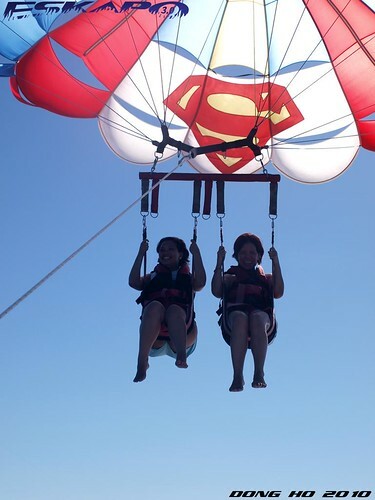 That's a fun way to get another perspective of Boracay. How long were you up in the air? Oh, what a thrilling experience! 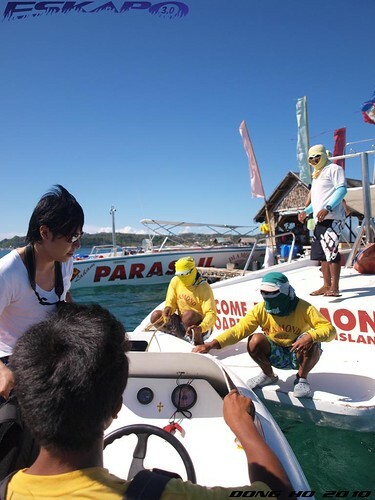 how much is going rate of para-sailing in Boracay? Very summery! I love the idea! Sana ako din, kayanin ang ganyang adventure. clap clap clap! tapang talaga! that is so much fun. i think i would love to try that too. Grabe, must have been an awesome experience. a must try nga! Wow, I wish I can experience this too! This is a beautiful place to visit and one of the charming places of the world. You can run through your activities and desires beyond the boards and enjoy the thrill of the life. Besides it, you can shop your imaginations. That's nice you made a good use of parachute.. I've always wanted to try this, but I don't have the guts to do so! poor me!